For the most part, macro algae is simple to care for and is a great way to add color and diversity to your tank. No true ecosystem is complete without it, and it is an inexpensive way to design a great looking tank. Macro algae filters nutrients from your tank, competes with nuisance algae and benefits overall water quality. Many species are suitable places for refuge for beneficial inverts like copepods and amphipods. Macro algae gives your fish the cover they look for in nature, and increases their quality of life. For example, many species of seahorses depend on macro algae and sea grasses for their survival. 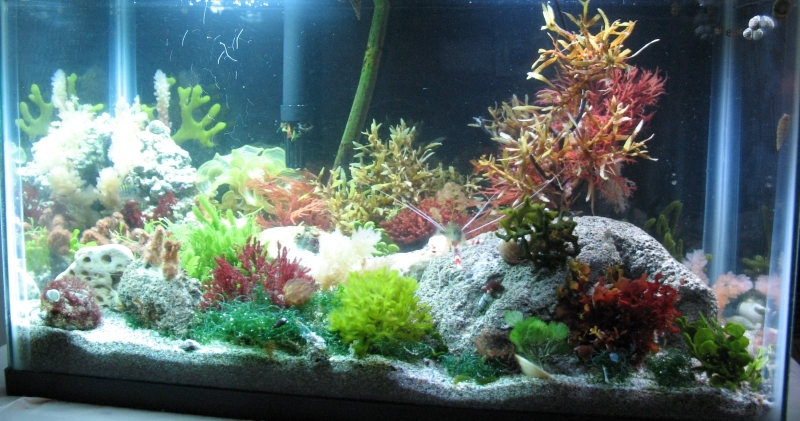 Most macro algae can survive in a tank with lower lighting when compared to corals. Macro algae adds dissolved oxygen to your marine tank. Many "macros" are tough, and can handle temperature and environmental changes better than coral, making it ideal for the beginning aquarist. The biggest concern the aquarist should have regarding macro algae is if the "plant", (macro algae is not really a vascular plant, but the term "plant" is commonly used both in the hobby and in scientific journals), has a tendency to "go sexual". When macro algae goes sexual, it releases spores into the water to reproduce somewhere else, normally because it is dying. This is normally a result of poor lighting, lack of nutrients or lack of pruning. The problem is twofold; one extra nutrients from the plant are released into the water which may raise nitrate and phosphorous levels, but more importantly the plant will respire more than normal. The nutrients problem is a small one, and if the dead plant matter can be removed, the remaining macros will absorb the extra nutrients and the balance will be restored. On the other hand the respiration is a bit more serious. Macros give off oxygen during the day, and will release some carbon dioxide at night. This is natural, and not cause for much concern. If the lighting in your tank fails for extended periods of time, or the plants go sexual for some other reason it will respire more than normal and release more carbon dioxide than it would usually release. This can become problematic, as water that is super saturated with carbon dioxide is likely to have ph fluctuations. If the fluctuation is severe, it can cause deaths in the tank. There are some tried and true ways of dealing with this potential problem. The first and best way is to have your main tank attached to another tank like a refugium or sump that operates on a separate or a "reverse photocycle". (Which basically means when the lights in one tank are on the other tank's lights are off, and vice versa). By having one tank releasing oxygen while the other is releasing carbon dioxide the system will remain in balance. Another way is to try to keep a good current in your tank so that a natural air mixture is achieved. If you are a beginner, you should try to stay away from algae that have a tendency to go sexual (like caulerpa for example). We keep risk evaluations on all the macros we sell, which you can read about in our Growing Guide Section. Cautionary language is also included where applicable in our product descriptions. Don't let this potential problem scare you away from trying to keep macro algae. We have had many plants go sexual on us, and our tanks have never crashed because of this problem. This is just one of those things you should be aware of as you build your marine planted tank. If the tank you are using to filter your system is going to be seen, then by all means get a diverse group of macroalgae and make a display sump or refugium. If you are as addicted to this hobby as we are, you will certainly have fun setting up this new tank. If on the other hand the filtration area of your tank will be hidden from view, you are better of with just some strong filtering macros. The kingdom of macro algae is broken down into 3 parts, the red macros (the most diverse), the brown macros, and the green macros. As a general rule, green macro is better at filtration than the others, as it tends grow faster than the others. Caulerpa and Chaeto both grow very fast, although as mentioned before, Caulerpa is not without its flaws. Scroll Algae is one of the best at filtering out of the brown macros, and Brown Gracilaria and Red Gracilaria are the best out of the red macros we have, (all gracilaria are red macros, despite their color) , but neither is as good as Chaeto. Mangroves, (which aren't a macro, but a true vascular plant), is in our opinion the best at filtration in terms of the volume it takes up in your tank. However, because Mangroves grow up and out of the tank, they should be combined with Chaeto for maximum filtration results. This filtration team is common in nature, and Chaeto is found primarily among mangrove roots in protected bays. Temperature: mid to upper 70's, although 72-86 is what they can handle, with short durations of cold endured. Iodine: .4 is the standard (Don't beat yourself up on this, water changes usually are sufficient). Iron: Keep it around .1ppm - Ferrous iron is the best, as it is easily utilized by plants and macros. Nitrates: a steady amount around 10-5ppm is ideal for macro tanks. If you use macros strictly for filtering, then you probably want them at zero. If you can find the balance of all the nitrates your macro can take, and keep the tank at a steady zero with good growth than that is of course the most ideal place to be, but it is difficult to do without limiting growth. Potassium and minor nutrients can be taken care of with the regular water changes. For best results we recommend using 6500k bulbs that are powerful enough to give off 2-4 watts of PC or more efficient lighting per gallon of water in your aquarium for most macro species in a standard depth tank. (Some sea grasses like turtle grass require more light). While light intensity is measured in output rather than watts, it is often difficult to determine the output of a particular light source, and watts are sometimes a useful secondary measure. Lighting can have an powerful effect not only on the survivability of the algae, but also on its appearance. For example, in red algae, if the alga is going to dark, (that is too deep a red), then it is not getting enough light, and the green chlorophyll in the alga, (alga is the singular for algae, but watch me use it both ways all the time like it doesn't matter), are being overpowered by the other pigments in the alga. These other pigments are called phycobilins, some of which reflect red, and some of which reflect blue. (The red reflecting ones are phycoerythrin, and the blue reflecting ones are phycocyanin). If your light is too strong, it can cause the green chlorophyll, (present in all algae), to become too strong, and overpower the pigments that give red and brown algae their distinctive colors, turning them greenish or pale. In this case, try to maneuver the algae in such a way that it becomes shaded from the full force of the lighting.Other lighting scenarios can produce different color changes in certain red algae. The ideas discusses in this article are simply to give you a picture of the conditions present in what we think is the "ideal macro tank". You don't need to be perfect for macro to do well, and sometimes it is best not to over think it too much, just keep it simple. Macro algae is relatively easy to keep when compared to corals and delicate fish, and we think with proper patience and adherence to some of the more basic rules you will be able to do just fine.Our best tip to you is to plant any trimmings you make, as the original plant will not live forever. By using the younger portions of the plant you can keep the algae going much longer, if not indefinitely.